Detective is more overtly reminiscent of Arthur Conan Doyle's Sherlock Holmes. Our lead character Advaita Bhushan (Vishal) ticks off almost every item on the "DIY Sherlock Holmes" kit. He has the eccentricity, the incomparable intelligence, a unique hat, a wall adorned with books, his personal Dr. Watson and Mrs. Hudson, and so forth. Even though the movie lacks a true Irene Adler or a Moriarty, most of the primary pieces of the puzzle are laid out in front of the audience. However, there are closer parallels between this film and Unforgiven, the 1992 Clint Eastwood-starrer Unforgiven that has one of the best heroes' journeys ever put to film. Specifically, one. Unforgiven is one of those rare heartfelt Westerns sandwiched between an opening and closing text crawl. The text crawl speaks of William Munny's late wife and questions her intent behind choosing to marry a man like Munny who has been categorized as a thief and a murderer with no redeeming qualities. The film itself works at justifying and vindicating her decision by carefully illustrating the man behind the veneer. And even though Detective does not match Unforgiven in terms of pure quality, it shares many of the latter's merits and tropes. Four seemingly unrelated deaths happen on a cold and lonely night. A father and his son are struck by lightening on a terrace, the Commissioner of the police force dies after blood oozes from his facial orifices, and a school boy's Pomeranian is discovered killed with its tooth missing. The next morning we catch private detective Advaita Bhushan being disillusioned with his life and profession. His life is unfulfilled because there are no crimes and misdemeanours he can't solve in a quick second. He needs a challenge. And when the school boy Kishore approaches him about his dog, the detective and his cohort Mano (Prasanna) slide into a story filled with some serious crime and intrigue. Mysskin's Detective is a good mystery that falls painfully short of being truly great. While we'll get to the many upsides in a bit, the movie fails at character development, which in turn leads to a problem with its pacing. While Detective Bhushan goes out of his way to say his current assignment is worthy of his intellect, the film has him dispose of problems in his way with the same ease (with plot conveniences and all) as you pick karivepaaku out of your koora. There is no tension to be found anywhere, no skeletons from the past to deal with for the protagonist, no emotional minefields to face up to. While it is still not the kind of star vehicle our "heroes" inhale on a daily basis, it lacks Mysskin's distinct narrative splendour. Simply put, it is more Murugadoss than Mysskin. If however you turn a blind eye to this omnipresent problem, you have an engaging mystery which refuses to drop the energy that it has right from the first scene. When it is in its element, the movie's pace matches that of its hyper-intelligent lead. It employs you to pay attention to every single plot point and dark joke, and rarely waits for you to catch your breath. Hidden in the backgrounds are innocuous dead bodies, glaring at you in the foreground is Vishal sitting on his high back chair with an open book on his head, and 360-degree shots have Devil attempting to make a gym-freak's dream breakfast with 10 eggs on one pan. The movie offers no respite as it makes full use of its runtime of over 150 minutes. 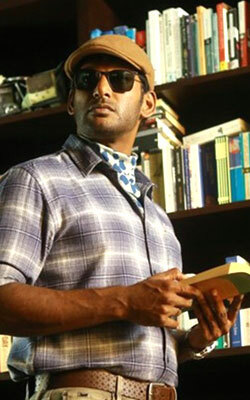 Vishal finds himself a role that works tirelessly at accentuating his best attributes. His imposing physical presence when combined with an ascot cap and a cravat create an indelible image of South India's very own Sherlock Holmes. While Vishal carries the film with ease, his co-stars are a homogenous blend of one-note characters. Their performances are not bad - they are merely functional. Andrea Jeremiah's femme fatale Pritha, Anu Emmanuel's pickpocket with a heart of gold Mallika, and Vinay's Devil are all poorly defined. The most glaring of character issues comes with Prasanna's Dr. Watson-prototype Manu. While he provides ample humour with his antics, the lack of his presence would not have affected the story or Bhushan's life in any tangible way. Manu is not an inextricable part of the main narrative, and it hurts the credibility of a character who has been essayed so nimbly on screen. The score accompanying the primary duo's many movements, while apt, is on a constant loop, with newer themes never really capturing the sense of atmosphere the ones at the start of the movie do. The fact that this is not one of Mysskin's indie projects also add to the film not having a true visual identity of its own. Even though it looks better than the average film, it pales in comparison to the director's previously-set lofty standards. Even though the movie has questionable filmmaking and leaps in logic at a few junctures, you are left with an appreciation of its primary character and journey. Pedaling back to some of the themes discussed in para two, Bhushan is a character who does not ask to be liked. The film does not spend its time glorifying his many enviable attributes. It also never shies away from showing the audience the many destructive shades of his behaviour. He is not a sympathetic character, but he has people in his world who choose to let him into theirs. Over the course of the movie, the audience learns to tolerate (not love) his genius, just like his band of friends does. And in a way, we understand why William Munny's wife chose to spend her life with him. Be the first to comment on Detective! Just use the simple form below. fullhyd.com has 700,000+ monthly visits. Tell Hyderabad what you feel about Detective!